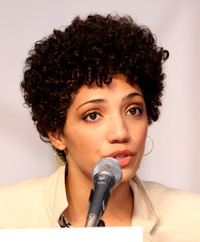 Jasika Nicole Pruitt is an American actress and illustrator from Birmingham, Alabama. She is best known for portraying Astrid Farnsworth in the Fox television series Fringe. This webpage uses material from the Wikipedia article "Jasika_Nicole" and is licensed under the GNU Free Documentation License. Reality TV World is not responsible for any errors or omissions the Wikipedia article may contain.